(Getty Images) – Topping off the Winter white Oscar trend, Gwyneth Paltrow looked ah-mazing in her form fitting gown and chic floor length cape. The intricate diamond cuff and ring top off her stunning ensemble. She never fails to disappoint with her effortless sleek style. (via Fashionologie) – Elie Saab ranks somewhere in between dreams and fairytales. The perfect combination of glamour and romanticism, Milla Jovovich dazzled in the ornate gown by the designer. (via Celebrity-Gossip) – Rooney Mara shied away from her usual dark hued choices, and opted for a romantic fluid gown. I love that she let the dress make a statement, without donning jewelry. (via Mail Online) – Giuliana Rancic truly shined. The ultimate definition of a oscar gown. 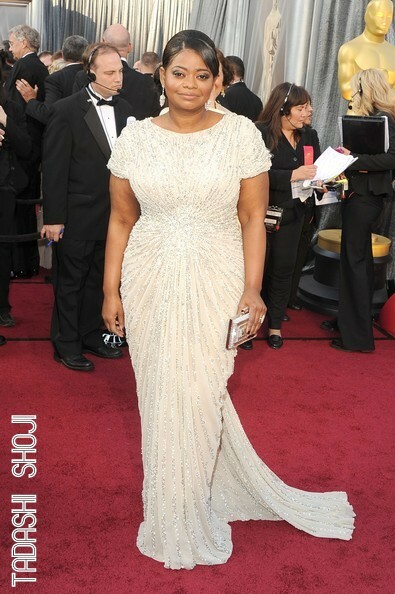 (Getty Images) – Octavia Spencer looked absolutely stunning in this beaded fitted gown. She made perfect choices with color, fit, and sparkle. I couldn’t be happier for her emotional win for Best Actress in a Supporting Role for The Help. Congratulations to Meryl Streep, ecstatic for her 3rd win & 17th nom!